Cisco kicked off its 25th annual customer show with the theme of "Tomorrow Starts Here" and a big emphasis on two initiatives: the Internet of Everything and its new Application Centric Infrastructure. 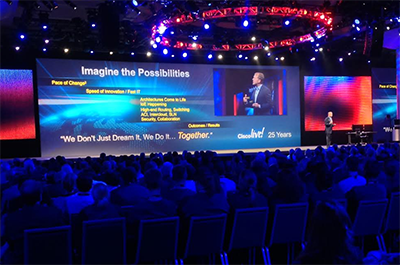 In a keynote address in San Francisco to a registered crowd of 25,000 + 200,000 online viewers, Cisco's CEO John Chambers began by saying that he expects the next few years will bring "a brutal consolidation to the networking industry. " Cisco has a goal of becoming the world's leading IT vendor and Chambers predicts that many of its competitors today will be out of business by 2018. He vowed that Cisco will lead the transformation to software-defined networks in part because it stands alone in the industry with a clearly differentiated, end-to-end network architecture based on driving application performance. Chambers said that Cisco's decision to pursue custom ASICS to deliver programmable policy control will give it a permanent price/performance advantage in SDN. Likewise with the nascent market for the Internet of Everything, Chambers said "no one will eat our lunch". An archive of the presentation in online. Verizon Wireless kicked off a marketing campaign to promote XLTE – its new network architecture that aggregates AWS spectrum with the company's existing 700 MHz spectrum to deliver 2x the capacity of regular LTE. XLTE Ready devices automatically access both 700 MHz spectrum and the AWS spectrum in XLTE cities. Customers with 4G LTE devices operating solely on the 700 MHz spectrum in XLTE markets also benefit from the extra capacity created by XLTE Ready device traffic moving to the AWS spectrum. Verizon said nearly all of the devices it sells, including the newest DROID devices, Samsung Galaxy S4, S5 and Note 3, and the iPhone 5c and iPhone 5s, are XLTE ReadVy when purchased. "The industry and tech world recognize this is a big deal, and we want consumers to know, too," said Ken Dixon, chief marketing officer of Verizon Wireless. "We continue to offer the very best network, bar none. 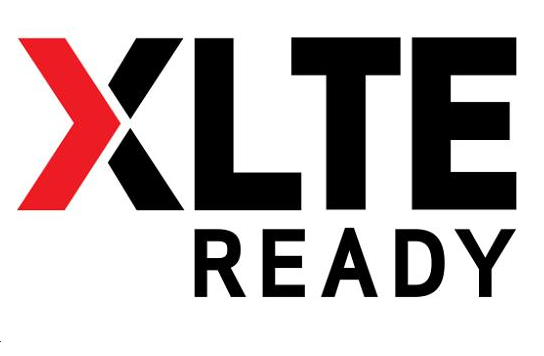 Now, XLTE provides an even greater advantage to customers by doubling the 4G LTE bandwidth and providing faster peak speeds in cities coast to coast." 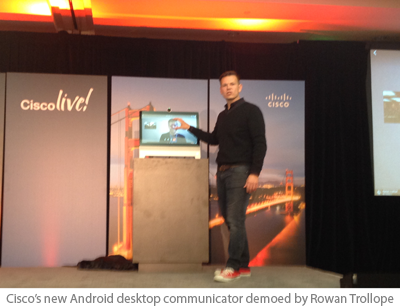 Cisco introduced an Android-based desktop collaboration screen that consolidates Cisco IP phone, HD video conferencing, Web browsing, whiteboarding and collaboration tools. It features a hardened version of Android, H.265 codecs, and four wide-band microphones with dynamic noise reduction technology. The device is open for 3rd party applications. Two versions will be offered with pricing for a 24-inch touchscreen version at under $2,000. +Cisco is also expanding on its WebEx platform to deliver what it calls "Collaborative Meeting Rooms" in the cloud. Attendees will be able to join the hosted meetings whether they choose a Cisco video endpoint, standards-based video endpoints, or desktop/mobile software clients. Cisco said its solution can accommodate more concurrent users than any other enterprise-grade solution on the market. 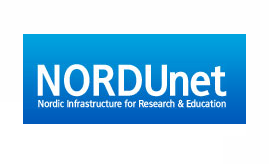 NORDUnet, an international collaboration between the Nordic national computer networks for research and education (R&E), is deploying converged packet optical platforms and software from Ciena, for programmable 100G Optical Transport Network (OTN) switching. NORDUnet, which operates an optical transmission system throughout Denmark, Sweden, Norway, Finland, Iceland, Germany, Holland and the UK, will use the network update to provide improved network automation and management capabilities. In addition, Ciena’s Network Transformation Solutions (NTS) consultative practice is providing a comprehensive operations and maintenance package designed for NORDUnet’s unique requirements. 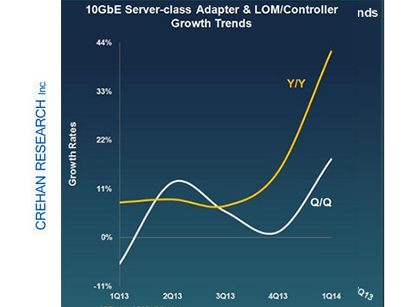 Following some recent softness, the 10 Gigabit Ethernet (10GbE) server networking market delivered impressive results in 1Q14, according to the latest server-class adapter & LOM/controller report from Crehan Research.The strong showing was even more noteworthy given that servers based on Intel's next-generation Grantley platform have not yet hit the market. "New server micro-architecture platforms, such as Grantley, tend to drive a positive step-function in demand for higher networking speeds," said Seamus Crehan, president of Crehan Research. "The increased processor performance puts greater demands on the network in conjunction with driving a server-upgrade purchase cycle," he explained. "Such stellar results in the seasonally-soft first calendar quarter, even prior to the arrival of Grantley-based servers, are positive indicators for the market's future growth." Last quarter, Crehan Research reported that 10GbE data center switch shipments surpassed those of 1GbE to become a majority of total data center switch shipments. Many of those ports are deployed as uplink, aggregation and core networking connections. Crehan Research now reports that this technology is starting to migrate to direct server access in much greater volumes. Microsemi Corporation introduced its Low Noise Chip Scale Atomic Clock (LN CSAC), which combines the best of oven-controlled crystal oscillator (OCXO) and standard CSAC technologies by employing an ultra-low power crystal oscillator within the control loop of the atomic clock to optimize Allan deviation and phase noise. 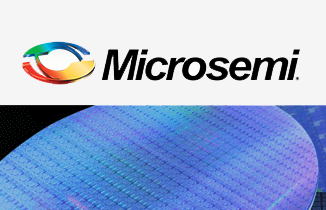 Microsemi said its innovations in processing, packaging and manufacturing makes possible portable atomic clocks with leading-edge performance and specifications, including for low noise, which is a critical parameter in many radar and communication applications for both military and industrial sectors. "LN CSAC leverages the leading edge ultra-low power atomic clock technology developed by Microsemi to produce the only commercially available low power frequency reference and timing module unique within the industry," said Peter Cash, business area director of Microsemi's Space, Defense and Avionics (SDA) business. "This new device produces atomic clock accuracy and crystal oscillator signal purity that can operate using battery power to provide low power signal generation for a broad range of applications. These capabilities operate within the volume of typical ovenized crystal oscillators using a fraction of the power, with features common in sophisticated timing modules." Level 3 Communications landed a multi-year contract with the United States Courts to provide network infrastructure and services to improve overall communications quality and management throughout the federal judicial system. Under the General Services Administration (GSA) Networx Enterprise contract, Level 3 will deliver direct connections to each of the designated sites via IP virtual private network (VPN), optical wavelength and Ethernet access services. The expanded Wide Area Network (WAN) architecture will maximize network routing options and redundancy for nationwide communications traffic between all U.S. Courts sites to ensure greater reliability, security and operating efficiencies –the primary challenges facing multi-site organizations today. The U.S. Courts were looking to simplify nationwide operations onto a single communications platform for nearly 300 sites, including the U.S. Courts of Appeals, U.S. District Courts, U.S. Bankruptcy Courts and U.S. Courts of Special Jurisdiction. Level 3 said the contract also covers session initiated protocol (SIP) trunking services, capitalizing on enhanced WAN connectivity to provide an Internet-based platform for local- to long-distance voice services. Level 3's Voice Complete portfolio of SIP-based services will deliver enhanced service options and a growth platform for the future, while also ensuring greater continuity of operations and disaster recovery (COOP/DR) by streamlining voice communications management for the federal judicial system. Switzerland-based u-blox has acquired connectBlue AB, a supplier of industrial-grade short range radio modules including Bluetooth and 802.11 Wi-Fi, for SEK 185 million (CHF 25 million). The connectBlue modules are used to enable the last hundreds of meters of connectivity between equipment and the internet. connectBlue is based in Malmo, Sweden. "The Internet of Things requires end-to-end connectivity to allow powerful applications to manage mission- and business-critical devices such as health monitoring and point of sales terminals, factory automation and vehicle sensors," said Thomas Seiler, u-blox CEO. "connectBlue's short range radio technology combined with our comprehensive line of cellular modems and satellite positioning receivers allow us to provide a complete communication solution for thousands of existing and future applications. We are very pleased to work with our new colleagues in Sweden to build on the deep synergies between our businesses." u-blox supplies wireless and positioning semiconductors and modules for the automotive, industrial and consumer markets.